It is incurably defective and socially disastrous when a post SSCE student who scores 100 in the Joint Admission & Matriculation Board exams is admitted into the university to study a law course, for instance, with another student who scores 250 in the same exams. The former with lower mark and lower quotient is allowed admission because he or she comes from northern part of the country and benefits from the so called quota system allocations and considerations; while the latter is admitted under stringent conditions and marks requirements because he or she comes from the knowledgeable southern part of Nigeria. The consequences of the former on all spheres of Nigeria’s social development and conducts including the appointment and promotion of Judges in the country have remained irremediably grave till date. The conditions attached to a bail granted to Citizen Nnamdi Kanu (Prisoner-of-Conscience) Tuesday, April 25, 2017 at the Abuja Division of the Federal High Court are a clear attestation of the referenced quota system toxemia. The stringent bail conditions above mentioned are nothing short of quota system judicial disaster. This is more so when the said Judge ought to be learned and knowledgeable enough to be fully grasped with the spirit and letters of the law and the Constitution, having variously served as Attorney General of Katsina State, wife of Governor of Adamawa State, Judge of State and Federal High Court; and a private legal practitioner for not less than ten years before her appointment as a High Court Judge. It is recalled that the said Federal High Court, presided over by the said Hon Justice Binta Murtala Nyako has today granted bail to the detained leader of the Indigenous People of Biafra (IPOB) with the Yorean or Stone Age conditions. The quota system judicially disastrous conditions are as follows: (a) mandatory production of three sureties, including a “highly respected and recognized Jewish leader”, (b) mandatory production of a “highly placed person of Igbo extraction such as a Senator”, (c) mandatory production of “a highly respected person who is resident and owns landed property in Abuja”, (d) each of the three sureties is to mandatorily deposit N100 million each. Other stringent conditions imposed on Citizen Nnamdi Kanu’s bail are barring him from attending any rally or granting any form of interview and that Citizen Kanu must not be in a crowd exceeding 10 persons. He is also mandated to sign an undertaking to avail himself for trial at all times as well as to mandatorily surrender his Nigerian and British int’l passports. Citizen Nnamdi Kanu has since been returned to Kuje Prison pending the fulfilment of his stringent bail conditions. Shockingly and surprisingly, other Igbo citizens standing same pre trial with Citizen Nnamdi Kanu: Chidiebere Onwudiwe, Benjamin Madubugwu, and David Nwawuisi were denied bail by the court which has fixed July 11 and 12 to commence their trial. Citizen Nnamdi Kanu’s fundamental human rights to freedom of thought, conscience and religion contained in Section 38 of Nigeria’s 1999 Constitution and allied articles in African Rights Charter of 1981 and UN Covenant on Civil & Political Rights of 1976 have been gravely and inexcusably breached and infringed upon. By barring him from being found in a crowd not exceeding 10 persons, Citizen Kanu cannot attend any religious worship, functions or gathering; whether organized by Christian or Judaist groups. It also means that Citizen Kanu must not be found in the midst of his team of lawyers who are usually more than 10 in number. That is to say that his rights and access to legal defence, freedom of movement, association and peaceful assembly are gravely denied and infringed upon. These are in grave contravention of Sections 36 (6)-right to legal defense, 40-freedom of assembly and association and 41-freedom of movement of Nigeria’s 1999 Constitution. Other consequences of barring Citizen Nnamdi Kanu from being found in a crowd not exceeding 10 persons are that: Citizen Kanu cannot visit his King-father who is a prominent traditional ruler in one of the communities in Umuahia and has a retinue of royal cabinet members exceeding 10 persons. That he cannot visit her queen-mother who has a retinue of palace maidens and maids exceeding 10 persons; that he cannot visit his in-laws, paternal and maternal sides; that he cannot visit or see his siblings; that he cannot attend any function; that he cannot go to sporting fields for exercise and other sporting activities; that he cannot travel by air or by commercial land transport so as to avoid meeting a crowd peopled by more than 10 persons; that he cannot greet or be greeted by crowd or a mass of people; that he cannot receive or hold any meeting or play host to his comrades-in-aluta; that he cannot attend his rural or city kindred or clan meetings; and most importantly,that he can no longer attend court trial because he will be found in a crowd exceeding 10 persons. This is to mention but a few. Also on account of barring Citizen Nnamdi Kanu from granting any form of interview, his scared constitutional and legal rights to fair hearing and freedom of expression as contained in Sections 36 and 39 of Nigeria’s 1999 Constitution. 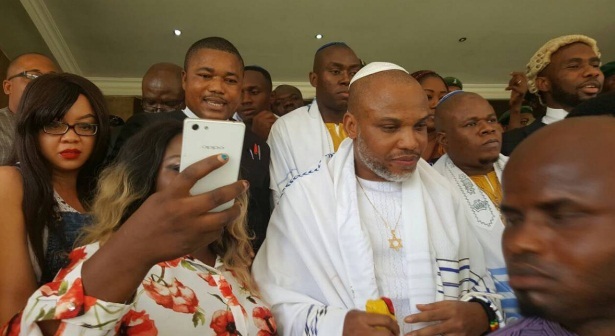 Why did Justice Binta Nyako insist that Citizen Nnamdi Kanu must provide a highly respected Jewish leader that will deposit N100 million for his bail? Does it mean that once one put on pre trial is a Catholic or a Muslim, one is mandatorily required to provide a Vatican Cardinal or a Saudi Sheik who must provide a cash of N100 million as bail surety? How many Muslim citizens standing pre trial in Nigeria, if any, have been asked to provide a highly respected Saudi Sheik from Saudi Arabia with N100 million cash deposit as bail bond? How many Boko Haram or Fulani terror suspects standing pre trial, if any, have been asked to provide such persons with such amount of money as bail bonds? Why imposing such stringent bail conditions on an innocent young man who has never levied any form of armed struggle in his advocacy activities in Nigeria or any part thereof; leaving out those who have massacred and continue to massacre thousands of innocent citizens on daily, if not on hourly basis in Nigeria or any part thereof? Why did Justice Binta Murtala Nyako deny other co-pretrial defendants: Chidiebere Onwudiwe, Ben Nwawusisi and Dave Madubugwu bail? We expressly and boldly call on the legal defence team of Citizen Nnamdi Kanu el al to reject in their totality the stringent conditions so imposed and quickly go for their variations or reversal. International Society for Civil Liberties and Rule of Law has indeed laid bare the factual legal implications of the draconic and horrific conditions imposed by Justice Binta on the bail of the indefatigable leader of IPOB, Nnamdi Kanu . The stringent conditions are not only lamentable but most condemnable. All lovers of justice must not allow this bare-faced sense of injustice as exhibited by Justice Binta to stand. It is unfortunate. This type of mess could happen in Nigeria because merits in the appointments of judges both at the federal and states levels. The International Society for Civil Liberties and Rule of Law has indeed laid bare the factual negative implications of the draconic and horrific conditions imposed by Justice Binta for the bail of the indefatigable leader of IPOB, Nnamdi Kanu . I concur with them in totality.The stringent conditions are not only lamentable and laughable but also most condemnable. All lovers of justice must not allow this bare-faced sense of injustice and utter lack of adequate understanding of the spirit the Nigerian Constitution and other extant aspects of the jurisprudence on the bail of an accused person as openly exhibited by Justice Binta to stand. Ultimately, this type of judicial mess could occur in Nigeria because merits have been jettisoned overboard in the appointments of judges both at the federal and states levels of this country in most recent times.It is pathetic. It is a bad signal for Nigeria and the entire mankind.